SACRAMENTO, Calif. (AP) Stephen Curry said it’s understandable that the Golden State Warriors are easing up a bit as the All-Star break approaches. The two-time NBA MVP also realizes it’s critical that the defending champs push through the tough times. 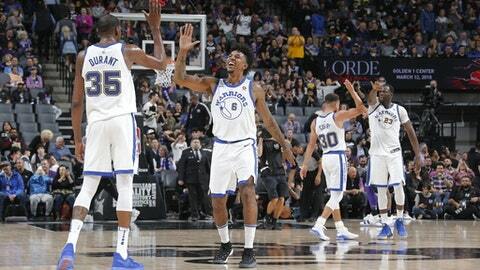 Kevin Durant scored 13 of his 33 points in the fourth quarter and matched his season-high with six 3-pointers, and the Warriors held on to beat the Sacramento Kings 119-104 on Friday night. Three nights after getting blown out in Utah while suffering their worst loss of the season, the Warriors looked a little sluggish early before pulling away to even the season series with Sacramento and give coach Steve Kerr his 248th career victory. Golden State also improved to 11-0 in games following losses while spoiling Sacramento coach Dave Joeger’s return to the bench. It wasn’t easy keeping that streak going. Sacramento trailed by 14 before pulling to 89-88 with 7:55 remaining following three consecutive baskets by Buddy Hield. Omri Casspi stopped the slide for the Warriors with a driving layup, Draymond Green added a three-point play and Nick Young made a 3-pointer. Durant then scored the next 10 points for Golden State, including back-to-back 3s. The Warriors committed 25 turnovers but the Kings rarely took advantage and finished with 19 points off the miscues. Curry added 23 points and six assists, Klay Thompson scored 20 points and Green had 13 points, nine rebounds and six assists for Golden State. Both teams were playing the front end of back-to-back games. Durant, who missed an easy uncontested layup on a drive from the baseline, fueled the win despite sitting out much of the first half following Golden State’s slow start. He scored 15 points in the second quarter on 6-for-7 shooting, had a key three-point play early in the fourth and then helped the Warriors close out the win late. Zach Randolph had 18 points and seven rebounds, Justin Jackson scored 17 and De’Aaron Fox added 16 point and six assists for Sacramento. Joerger, who was called for a technical in the fourth quarter, returned after briefly dropping to his knees during Sunday’s game in San Antonio. Joerger missed the remainder of that game and did not coach in New Orleans on Thursday. The Warriors won another lopsided game despite being without Shaun Livingston (personal reasons), Jordan Bell (left ankle), Andre Igoudala (rest) and David West (rest). Warriors: It wasn’t the crispest of games but it was a much better effort than Golden State had in their 129-99 loss to Utah. Most encouraging for Kerr’s team was that they rallied after falling behind by double digits early in the first, with the comeback coming while four of the starters were on the bench. That depth continues to be the Warriors best weapon. Kings: Sacramento had a chance to take control early in the game but couldn’t sustain the early momentum. The defense, which helped start the comeback in the fourth, fell apart late and allowed the Warriors to shoot 55 percent for the game. Warriors: At Denver on Saturday. Kings: Host Dallas on Saturday.